After last week’s exciting Last Chance Kitchen entry into the competition (and quick exit) the chefs are back at it and ready to cook for their chance to be Top Chef. First, it’s time for the Quickfire where the chefs are tasked with making their version of Kentucky’s most famous sandwich: the hot brown. The traditional version is a nap-inducing, open-faced sandwich consisting of hot turkey, gravy, melted cheese and bacon on bread. Michelle is doing a breakfast version with eggs and “turkey ham” (?) inspired by her Mom’s breakfast meals. “My Mom would make ham and eggs for Sunday breakfast and the hot brown seems like a breakfast dish to me,” she says. As the clock winds down, Sara finds her turkey sausage-wrapped Scotch egg hot browns underdone but has one backup egg in the fryer. “I can’t serve them pink turkey,” she says. Will her eggs be cooked properly before time runs out? 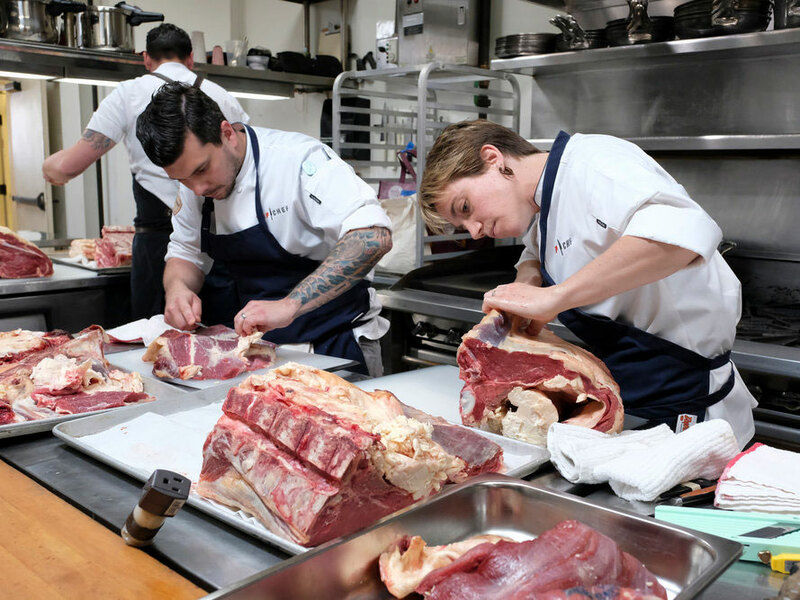 Later, the chefs are taking part in a beef-themed Elimination Challenge and two chefs have chosen to make steak tartare to show off their knife skills. Brandon and David both realize at Whole Foods that they’re making the same dish using different cuts of beef. Uh-oh. Brandon briefly debates going the cooked steak route but realizes that each steak dish he’s done has landed him in the middle of the pack. He wants to stand out so he chooses to stick to his guns and make tartare. David is sticking to his guns too and wants to make Asbury Park, NJ proud with his dish. “I really want to show Tom that someone else from his hometown has the ‘it’ factor,” David says. Kelsey can’t wait. “Are we having a tartare face off?” she asks excitedly at the checkout. We sure are. Episode 7 of Top Chef’ in Kentucky airs tonight at 8 p.m. ET/PT on Bravo. ‘Last Chance Kitchen’ streams immediately following the show at BravoTV.com/Last-Chance-Kitchen. Find additional interviews, chef bios, and more at BravoTV.com/TopChef.